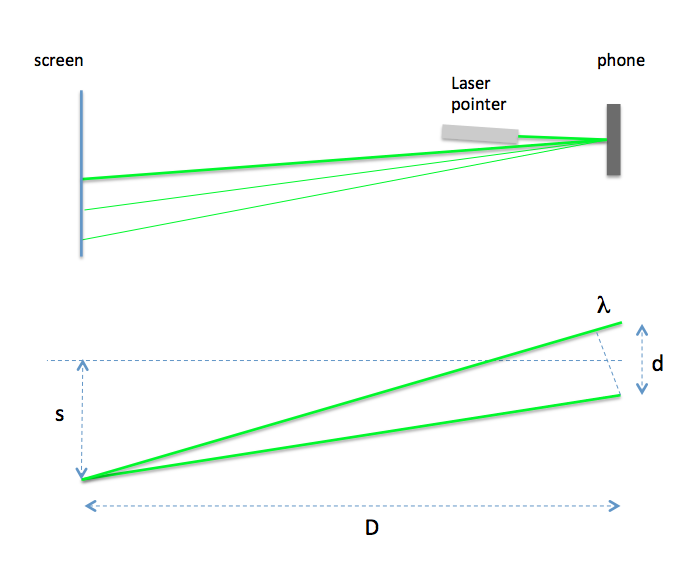 How to measure the wavelength of a laser pointer? I'm working on something and I need to know the wavelength of the laser pointer that I'm using. Can you suggest me a way, using some optics formulae, or anything else to calculate the wavelength? Your iPhone is a pretty good grating. 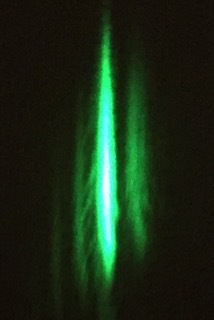 I just did a simple experiment with an iPhone, a green laser pointer and a sheet of graph paper. The display of the iPhone 6 has a resolution of 326 ppi - meaning we have a "grating spacing" of 25.4/326=0.0779 mm. Different models have different resolutions - make sure you find out what your phone has and don't just use the above. 6 Plus has 401 dpi, the 5 and 5s have 326 dpi. You can use pretty much any screen you happen to have lying around... if you can find the pixel size, you can use it. *Looking more closely at the image, the dot spacing is a little bit less than 5/7 - using a ruler on the image I get about 8.75 mm. That improves the estimate to 541 nm... getting within 2% of the actual value. I doubt my exercise book paper is more accurate than that. 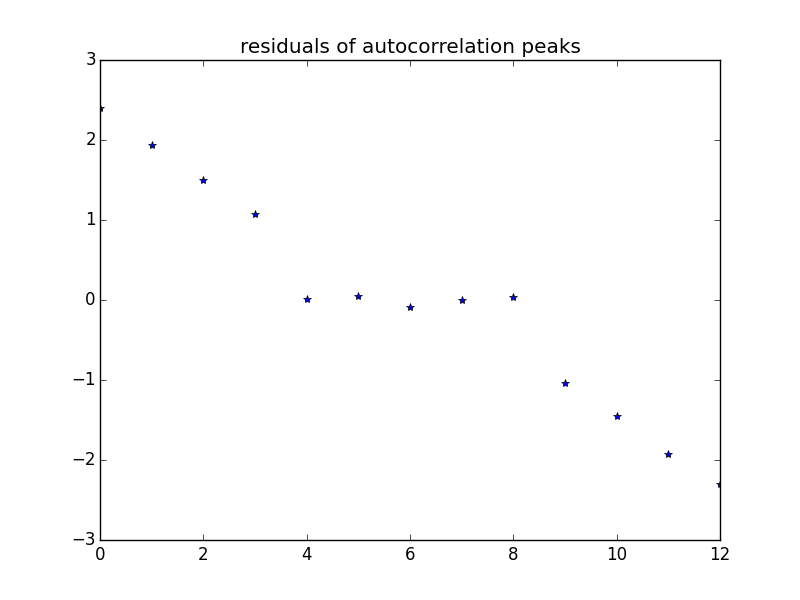 So I did play around a bit more with the data. First, I re-measured the distance from the kitchen counter to the ceiling and found that the width of my tape measure wasn't what I thought it was. This made the distance 1 cm larger than I originally had it; also, using some autocorrelation and filtering functions, I found the "true" peak spacing was 8.85 mm, and my new estimate of the wavelength from the first image was updated to 539 nm. Next I tried to use the last image - "self calibrated" image taken with the front facing camera of the 6 Plus. It is hard to get good specs on the camera: from metadata I found the focal length was 2.65 mm, but the pixel size is more elusive. I tried two different methods: in the first method I placed a ruler at exactly 12" (± 0.1") from the front of the camera, and could see 25 cm (± 3 mm). With 960 pixels across, this puts the angular resolution (angle / pixel) at about 0.87 mrad. Taking a picture of a ruler at this distance and analyzing the spacing between lines gave me a value of 0.88 mrad. This is within the error I expect from this measurement. 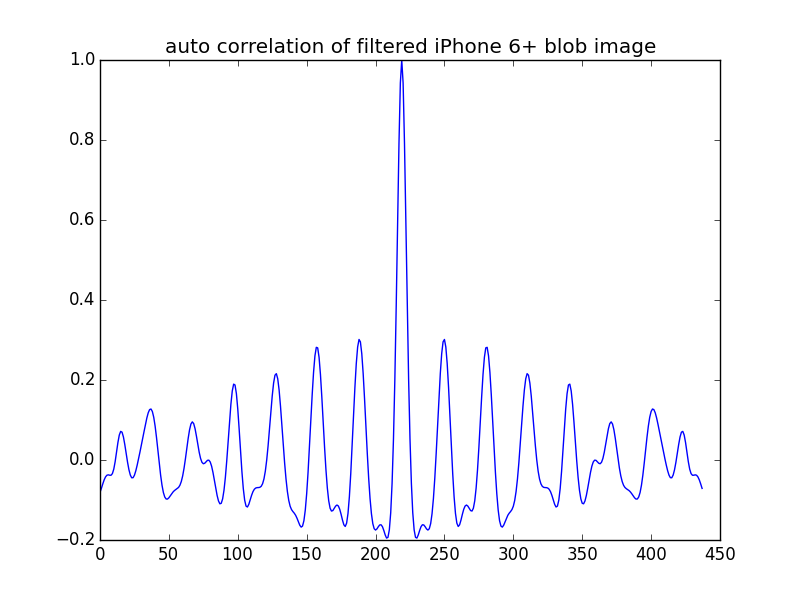 The "blobs" in the last photo were hard to measure accurately - but again some Fourier magic came to my rescue and I determined them to be spaced about 10.1 pixels apart. With the iPhone 6 plus having a finer grid, this gave me a wavelength of 564 nm. Not as good as the other measurement - but not bad for such a blobby image. It can be seen that the peak spacing in the blob image could be estimated with remarkable precision. I attribute the fact that the final answer was "not that great" to the lack of careful calibration of the camera - not the image obtained. There is hope for this method. I was curious how well CDs and DVDs might work, so I rigged up a slightly better experiment. Distance from disk to screen was 163 cm, and laser pointer was clamped to reduce motion. With the DVD (Blank Fujifilm 4.7 GB DVD-R), the first maxima were at 170 cm from the central spot, and it was quite easy to pick the location within a couple of mm (spot was narrower in the direction I was measuring). There is some ghosting, but the central peak is not hard to pick out. I am not sure if we are seeing unequal spacing between tracks at work, or multiple reflections in the CD coating - I suspect the latter as the effect was much stronger at the lower-angle second peak. The screen of an iPhone 6 is not perfectly flat, and if you happen to be measuring reflection of your laser pointer close to the edge it is possible you will get a different answer. To first order, all the diffraction peaks will be deflected by the same amount - but if there is appreciable curvature an accurate measurement will show a small difference. It would take a careful setup (proper clamps etc) to detect this; and it would detract from the "cool kitchen counter experiment" atmosphere of this one. with $n$ an integer and $d$ the distance between the centers of the slits. 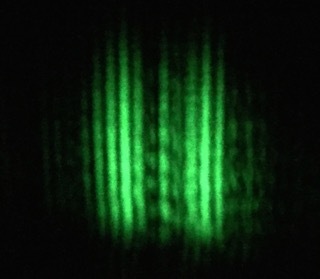 Of course a single or double slit experiment would also work, but is less precise. If you're in need of a grating: take a CD and read texnic's comment below. What's the problem with my Young slits experiment? Why does light reflected from an LED TV screen make a sharp X pattern? 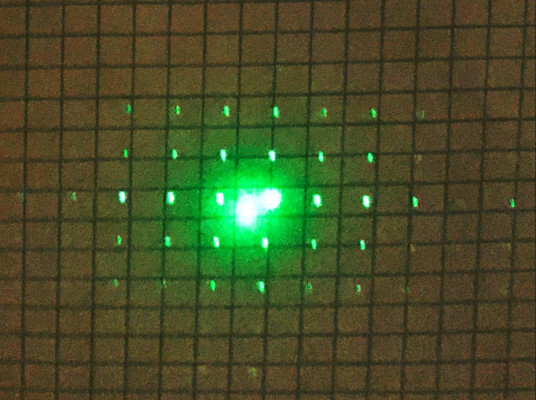 What explains a green laser reflecting off an orange ping pong ball producing bright yellow? How to measure the Intensity of light? Is there a tunable visible wavelength optical filter for exclusively filtering intense coherent laser light?